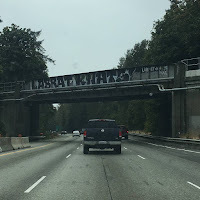 Living in Puget Sound over the last decade, I've noticed tagging and graffiti with LABRAT or LABRAT KNATS across bridges downtown, by Lacey (picture below, the site of the recent train derailment) and down to Olympia, Washington (State). So...I was running my own SSL cert from a free SSL certificate provider SSLForFree.com but thought I'd try the built in capability of my Synology DS413J to provision one from Let's Encrypt for free. Let's Encrypt go over HTTPS to keep your DiskStation secure. I originally was thinking my router, an Asus AC68U, wasn't capable of forwarding port 80 because it uses that port for the web interface. Turns out that later software updates fixed this issue and is now able to pass the traffic from outside:80->Synology:80. All good. I made sure Web Station was running. And it still failed. Turns out, I think the biggest issue was that even though the screen suggests you should just use your top TLD, you really need to put in your full FQDN in both the domain name and the alternative subject name fields. Then the wizard worked like a charm.